It is quite easy to add a PDF file content from other PDFs or images to create a new PDF file! 1.) ... Add PDFs or Images via Drag & Drop! 2.) ... Add from the MS-Explorer menu or Send To! 1.) Add PDFs or Images via Drag & Drop! With the freeware WinScan2PDF it is possible from version 3.85. You can add PDF files or images on the program or the program symbol or program link ergo shortcut. Then you can if necessary: ► set the order of the individual PDF pages! and optional: ► ... Change the quality of the PDF file! Or save the individual images from the PDF file ► ... as JPEG / PNG files! Please use ... always the latest version of WinScan2PDF! (Image-1) Add PDFs and images to the the PDF! 2.) Add from the MS-Explorer menu or Send To! See also: ... Rotate the image or scan before PDF create! (Image-2) Add PDFs pages from MS Explorer menu! 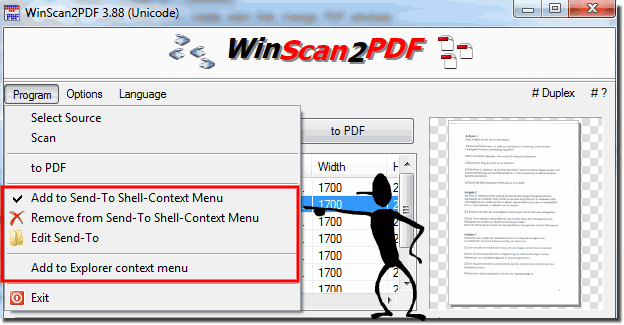 WinScan2PDF - FAQ-14: Add PDFs and images to the PDF? Front pages, back pages, sorting, duplex PDF scanning and printing! I would like to drag PDF files to the edit window of WinScan2PDF to get an image (as I can vice versa with images to create PDF files). Is that possible? (I always get an error message in a block window: Error -% PDF-1.7 without the minus sign and each other in the block! ?